The doctor costume accessory kit includes everything that you need to create a doctor costume. You can wear it as is or bloody it up using stage blood to create a scary doctors costume for Halloween or a haunted house. 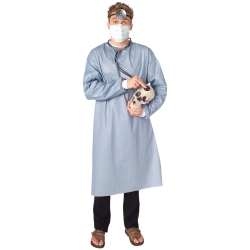 The doctor costume accessory kit includes a head mirror, a face mask, a plastic stethoscope, and a blue doctor's coat. Available in adult size men's standard.